Have you considered Facebook video advertising units as part of your online video marketing strategy? If you haven’t (or didn’t know it was an option) here’s some statistics to consider. Why should you care about video on Facebook? Facebook is one of the top-ten video sites in the world without even trying to be. According to a report by Comscore, Facebook was the 5th largest video site in April in total videos played coming in above dedicated video sites like CBS Interactive and even Hulu. According to the study done by TubeMogul, Facebook also delivers some of the most engaged viewers online. 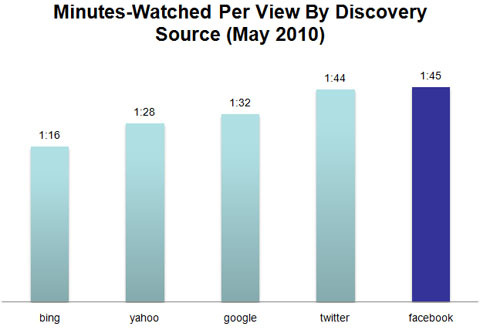 Their study found that Facebook leads all other discovery sources in terms of minutes-watched per view. Overall, it found that completion rates for Facebook ads were roughly 5.5% to 9.5% higher than identical videos run in display units on outside publisher sites. 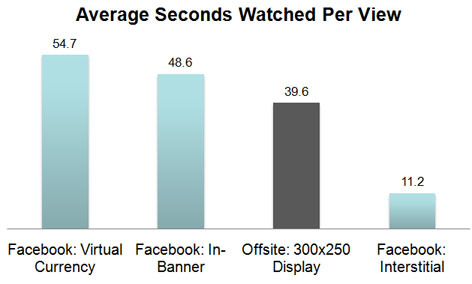 The Facebook virtual currency (or in-game video ad) also had the longest average view time, at 54.7 seconds per view, followed by the Facebook in-banner, at 48.6 seconds, the third-party in-banner, 39.6, and the Facebook interstitial (i.e. preroll video ads), at 11.2. It’s no surprise to me that the interstitials had the shortest view time because most viewers if given the option to skip them and get to the content they were originally trying to get to…will skip them. Even though in most cases they are much shorter than any of the other video ad formats here. 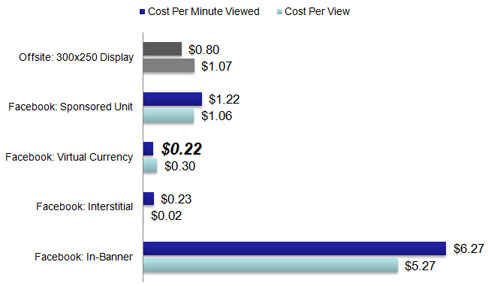 3/4 of Facebook ad units sampled have a lower average cost per view than comparable offsite display. Virtual currency ads were also the big winner here at 30 cents on a cost-per-view basis. That compares to $5.27 for Facebook app in-banner ads, $1.06 for Facebook’s sponsored video unit, and $1.07 for stand-alone video ads on other sites. Viewers were more likely to share videos in Facebook’s virtual currency and app in-banner ads with friends on Facebook or Twitter at 1.5% – 2% than video ads on other sites which were less than ½% for offsite video ads. The click-through rate on the virtual currency ad was also highest, at 5%, versus just over 3% for video display ads on third-party sites. So you may be thinking “Wow you get a lot of bang for your buck with the virtual currency, where do I sign up?” Not quite so fast. While social games like Farmville have a monthly audience of over 70 million this may not be the right demographic for your product, service or brand. So research the social game carefully before placing a video ad campaign. Also be wary that many of these game developers break the rules and allow gamers to click play on a video ad multiple times just to rack up points. So while the numbers may look impressive make sure you know your audience and research the game first. Is the virtual currency model in gaming the next big thing for video advertising? Are you REALLY getting an engaged viewer or are they just clicking through because they think that will earn them more points? What do you think? I saw a Facebook Sponsored Video Ad recently for a Comedy Central show and loved it. Would love even more to learn where I go to run one myself. Can’t find it anywhere. Thanks for any help you can provide. Any update on how to run a sponosored video ad on facebook ?